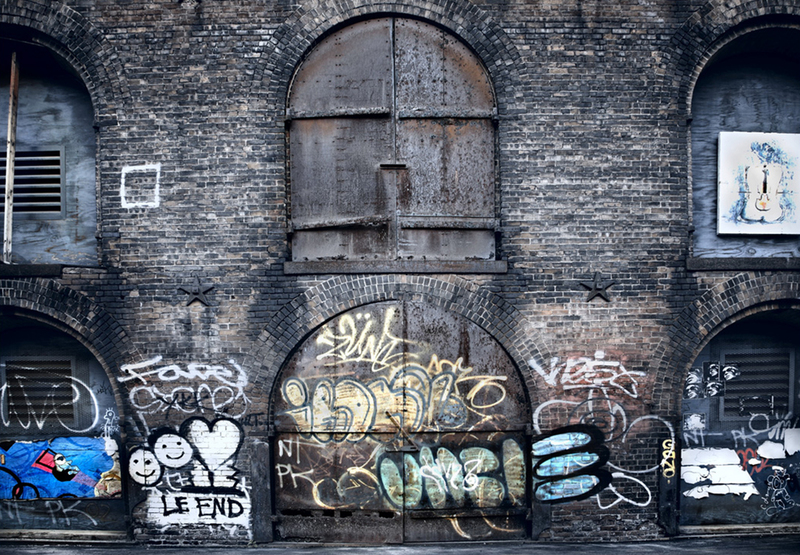 Widewalls has made a list of 10 artists that changed our perception of urban art. We deliberately didn’t put the title “emerging” because they all have an established solid reputation. We are talking about artists who are pointing their respective genre towards new directions and innovative art forms. They all work in different media but they have one thing in common, they stand out in moving the boundaries of what we consider art. In our opinion, each of the ten individuals from this list is doing outstanding work in the world of art. Meet the artists that shape the contemporary urban art scene. 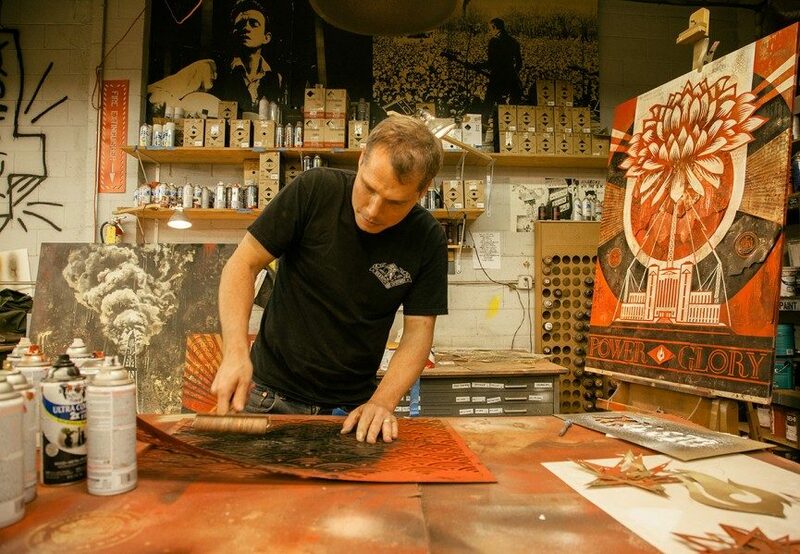 Shepard Fairey keeps himself busy. Two weeks ago the release of his t-shirts was announced by BNE. The artists lent his designs to the ‘Artists for Water’ campaign that will benefit the non-profit organization trying to realize clean drinking water for everyone. Shortly after the artist announced the release of his Ai Weiwei print through the Brooklyn Museum that will be showcasing Ai Weiwei next month. Again Shepard Fairey confirms his activist nature by donating these prints in order to help Ai Weiwei reclaim his passport from the Chinese authorities. Somewhere in between he also managed to visit his friend Moby at his exhibition ‘Innocents’ at LA Projects. Several days later he announced his upcoming exhibition at the Fairey gallery space Subliminal Projects. The exhibition will feature 50 of his most iconic cover art prints. The show titled ’50 Shades of Black’ opens April 16th and runs through May 17th. 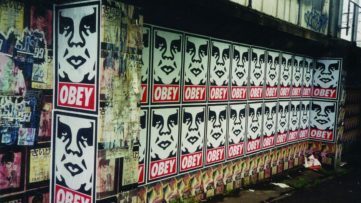 Until then Obey is sure to release numerous t-shirts, prints and news that will keep us writing about the doings of America’s urban art giant. 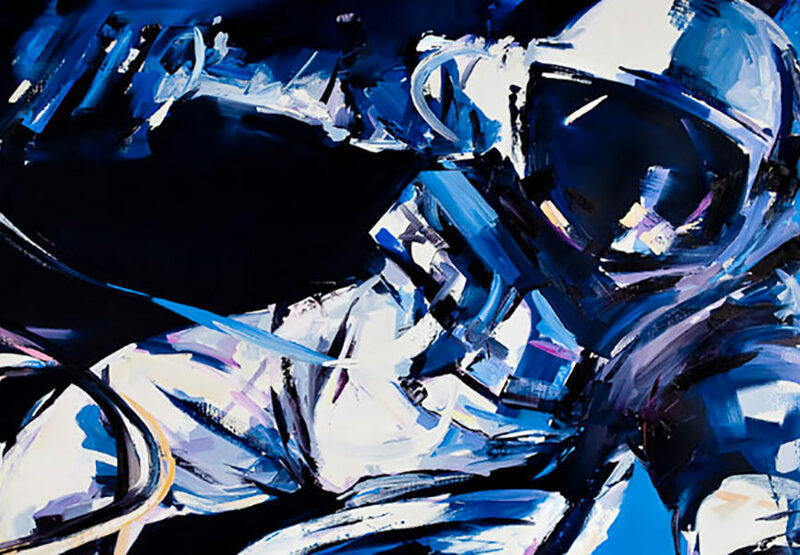 The Pointman series is probably the most recognizable Futura artwork. The success story of the point man began in 1988. 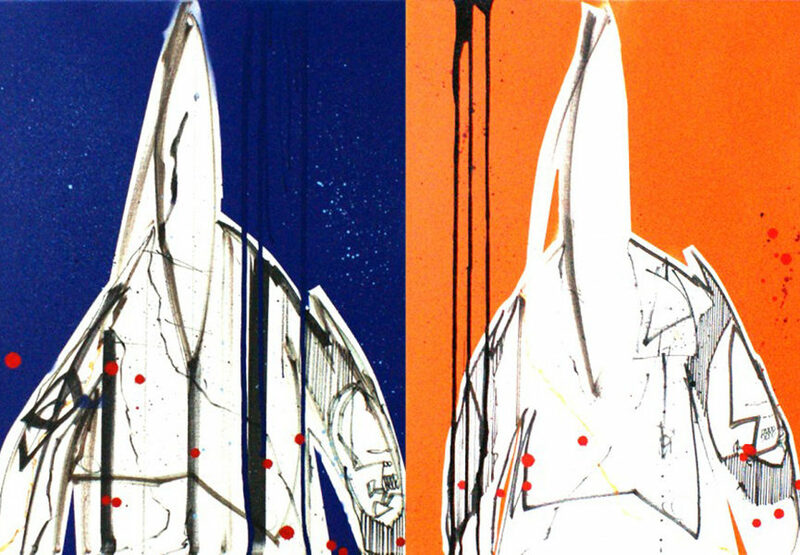 Futura was asked to design the cover art for UNKLE. Their debut album (Psyence Fiction) was also the debut of the Pointman. Futura created the Pointman as a robotic figure with an elongated head, giving it the shape of a Spaceship. 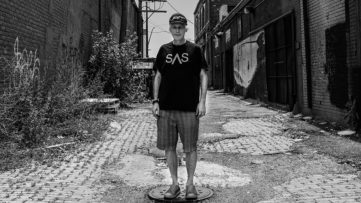 “Without the UNKLE experience, I don’t think anyone would have ever heard of the Pointman”. With the success of the music album came the success for the Pointman. Japanese toy manufacturer Medicom produced collectible toys. Bathing Ape, Nike and Levi’s were collaborators. The ventures gave Futura the opportunity to continue the development of his own brand: Futura LABARATORIES. The brand collaborated with the Japanese technical clothing company Descente that used the Pointman on several electronic accessories. The Pointman became the Futura signature piece and for us as Futura admirers it was a must. 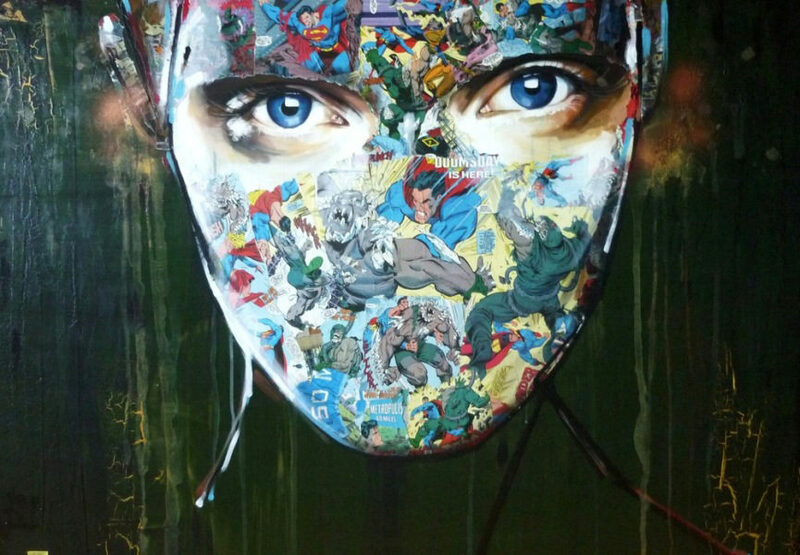 Seductive just enough to allure the observer into their bleak essence, the works created by a Canadian artist Sandra Chevrier compose an ode to female struggle with oppression and superficiality. 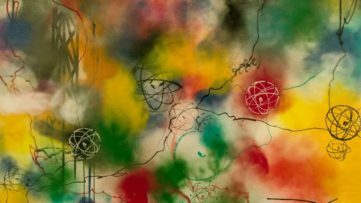 Her latest body of work is entitled Les Cages: A Fractured Gaze and it continues the narrative this self-taught and wonderfully talented artist commenced in thematically adjacent earlier series. MIRUS Gallery in San Francisco announced the exhibition of the same title, presenting Sandra Chevrier’s beautiful, but grim vision of feminine position. The show will present all new works on paper and canvas, opening on April 5 and running through May 10, 2014. Les Cages will be the first presentation of this artist at MIRUS Gallery.